﻿ Get the Right Message to the Right People with Click Segmentation » Red Mango Marketing! Nice work! You’ve crafted the perfect email to share with your subscriber list and just hit send—only a matter of time now before the sales come rolling in right? That’s because even the greatest email won’t get results if delivered to the wrong audience. To address this problem, Constant Contact is proud to introduce our new click segmentation tool that automatically categorizes your contacts into a list based on a customer’s expressed interests and email engagement. This feature means you’ll be able to share more targeted messages with interested audiences to boost those open and click rates. You can even pair with an autoresponder series to save more time by creating a click trigger that will automatically send to any newly-segmented contacts. When you choose to segment your contact lists, you’ll find that you can send shorter emails with a clear call-to-action more quickly. That’s because it is much simpler to write several emails aimed at a specific audience than attempting to make one email that is relevant to different audiences all at once. A yoga studio typically offers a variety of classes for purifying both mind and body, but not every offering will be applicable to every customer. For example, a prenatal yoga client probably has little to no interest in joining an intensive hot yoga calisthenics session. Similarly, an advanced yogi is not likely to sign up for a beginner-level promotion. 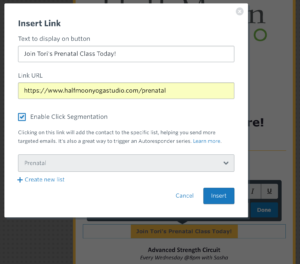 With click segmentation, our yoga studio can send out an email that includes links for various offers and then automatically segment customers based on the specific links they click within the email. Essentially, they’re now able to adapt follow-up email campaigns by leveraging previous customer behavior. Let’s say the yoga studio sends out a weekly newsletter that includes sign-up buttons for all of the different classes they’ll be offering that week. The studio can “Enable Click Segmentation” on the buttons to track clicks and filter each person into a corresponding list. For instance, people who click the link for “Prenatal Poses” as seen above, can then be grouped into a list for future prenatal-specific classes and promotions. From there, the studio will be able to better personalize its emails to reach a previously engaged audience more directly. Still not convinced about click segmentation? Well, according to studies from research firm eMarketer, 39 percent of marketers who segmented their email list experienced higher open rates. Plus, another 28 percent reported lower unsubscribe rates, while 24 percent indicated better deliverability and greater revenue. 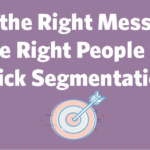 Adding click segmentation to your email marketing mix will allow your customers to tell you exactly what they’re looking for and categorize themselves, all with just the click of a button. 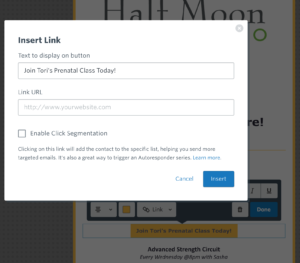 Trackable links let you assign click segmentation to any link through our third-generation editor, including text, button, or image links. Tracked links will automatically add contacts into lists when they are clicked. Now you can effortlessly set up click segmentation on any link in your email campaign to group customers based on their engagement. Segmented lists mean you can create a new list or select an existing one, then assign it to the tracked link. You’ll be able to view the list in the contacts section and leverage it for follow-up emails, event invites, or autoresponder series. This will help increase your open rates, and continue to build your customer relationships by providing relevant messages based on the content that resonates with them most. Autoresponder helps you efficiently engage with customers to stay top of mind by triggering when a contact clicks a particular link and gets added to a list. Enabling an autoresponder series can take the legwork out of the follow-up process, while still reaching your audience with targeted emails. If you’re ready to see your open and click rates skyrocket, check out our knowledge base guide on how to use click segmentation in an email and log in to get started. New to Constant Contact? The first 60 days are on us, so start your trial for free today! The post Get the Right Message to the Right People with Click Segmentation appeared first on Constant Contact Blogs. This entry was posted on Wednesday, November 22nd, 2017 at 8:00 am	and is filed under Automation, Email Marketing, News & Updates. You can follow any responses to this entry through the RSS 2.0 feed. Both comments and pings are currently closed.